All the #dh2014 editorial team is proud to announce the publication of 18 articles of DH2014 in Digital Scholarship in Humanities! Thank you a lot to Edward Van Outte for his support! We are proud to be the first DH meeting proceedings published in the renamed journal, Digital Scholarship in Humanities. About other #dh2014 articles published elsewhere: please announce yourself to claire.clivaz@isb-sib.ch: the references will be transmitted to the Communication Commission of ADHO. Missing already the DH2014? Videos are online! Thanks to the common work of the Unil team (Yannick Meyer) and EPFL team (Yannick Rochat), you can now enjoy the four videos of the opening/closing ceremonies, and of the Zampolli and Community lectures. Have a nice summer, while our DH Australian friends begin to prepare the DH 2015 conference! As local co-organizors of the DH2014, we express our huge gratitude to all of you for these wounderful days we have shared in Lausanne. Thank you to Melissa Terras, our amazing PC Chair, and to ADHO and all the DH associations. Thank you to Kevin Baumer for his uncredible involvement in this adventure, as well as to all our teams. Thank you to our institutions, the University of Lausanne and the EPFL, that supported this event so much, as well as to all our sponsors and partners. As many of you are already in Lausanne and have been attending workshops the last couple of days, the move to UNIL’s campus for the final three days of the conference is an easy on: one more stop on the Metro M1 from Renens Gare (or about a five minute walk down the road). The M1 stop for the Amphimax is called UNIL-Sorge. For everyone else, here are the details that should help guide your way. All of the information you will need to help guide you to the campus via public transportation can be found here. In addition, the exact schedule for Monday morning’s trains, including track numbers and detailed travel times, can be found by clicking here. Finding the registration desk at the Amphimax shouldn’t be too difficult. When leaving the metro, a parking lot and the Amphimax building will be right in front of you. Climb the stairs on the righthand side of the building (when you’re facing the lake), and you will find the entrance at the top. The capacity of the Amphimax cafeteria is limited and will not be able to accommodate all conference participants. It is recommended that you proceed to Unithèque during your lunches, as it is only a five minute walk away and contains much more capacity and dining options. All of the information you will need to help guide you to the campus via public transportation can be found here. In addition, the exact schedule for Monday morning’s trains, including track numbers and detailed travel times, can be found by clicking here. Finding the registration desk at the Swiss Tech is extremely easy, as you will just need to enter via the large main entrance on the upper level (can’t miss it). There are also two grocery stores and two take-away restaurants located in Les Arcades (in the STCC complex). EPFL’s restaurant/cafeteria website will give you much more detail on the daily offerings across the campus (in French). 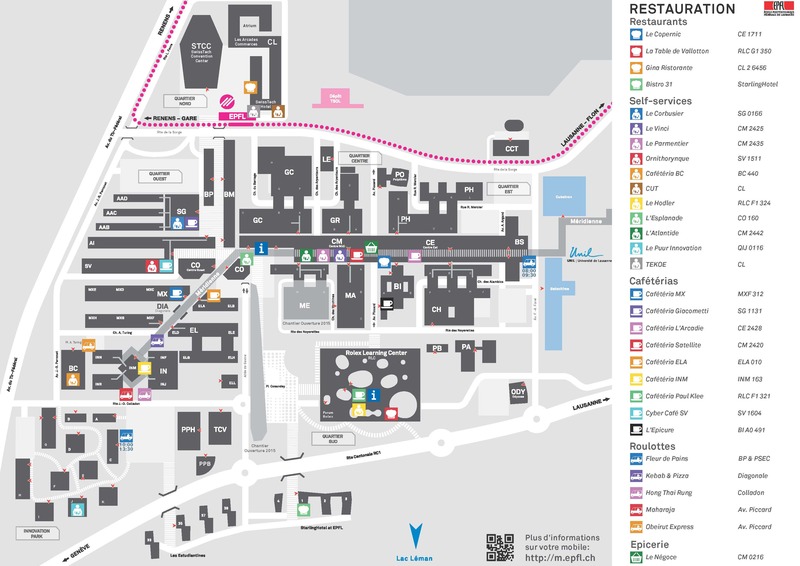 You will be able to narrow down the choice of dishes by type of food, including vegetarian options, then locate the cafeteria using the large map provided above.